Although it is now outdated, travel by train has been a significant part of New Mexico’s history for over 100 years. Many railroads in Santa Fe keep this history alive by offering train rides that are not just for means of transportation but to see the beautiful countryside around New Mexico’s capital. What better way is there to see stunning scenery than by sitting back and relaxing during a comfortable Santa Fe train ride? 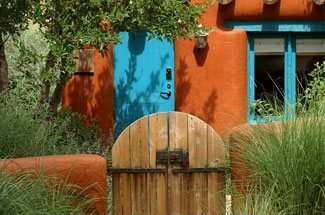 If you are looking to plan a Santa Fe getaway, our free Vacation Guide can help! It features recommendations on things to do during your stay, like taking a ride on a Santa Fe train or visiting a volcano at the Valles Caldera National Preserve. Let Four Kachinas Inn make your vacation planning a little easier! The Santa Fe Southern Railway offers an 18-mile ride from Santa Fe to the small village of Lamy. The train station is located just 5 minutes away from Four Kachinas Inn! Passengers will enjoy the beauty of the desert during their relaxing trip as well as experience history. The railway itself is over 120 years old and the historic railcars are from the 1920s! When you ride the Santa Fe Southern Railway, you are riding the same route that carried early tourist adventurers, settlers, artists and scientists into the city. Cumbers & Toltec is known as America’s highest and longest narrow gauge railroad. This ride goes from Chama, NM to Osier and Antonito, CO and boasts incredible elevation changes! It’s highest point of 10,015 feet will give you spectacular views of the expanse below. This breathtaking trip winds through several valleys, mountains, canyons, and deserts, each with its own stunning scenery. During this time, it is not uncommon to see antelope, eagles, bears, sheep, and several other animals in their natural habitats! This Santa Fe train offers three classes of service; if you are taking this as a scenic day trip, we recommend going first class! The Victorian elegance of the deluxe car will provide you with a delicious lunch buffet and attentive service. The Rio Metro is a great way for alternative transportation around New Mexico while you are staying at Four Kachinas Inn. Although this is not a train meant for leisurely scenic rides, passengers still experience the beautiful views out the windows. Pack a picnic lunch and sit at one of their tabletop seating options as you watch the scenery go by! This is a great transportation option if you are in town for an event or festival. The train will take you to and from the event so you don’t have to worry about driving and parking! 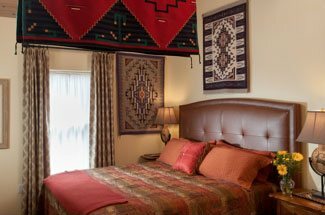 After your Santa Fe train ride, return to Four Kachinas Inn for a quiet evening at our bed and breakfast. Sip on a glass of wine in our beautiful garden courtyard as you reminisce about the stunning scenery you saw throughout the day. You’ll love our unique guest rooms, each featuring local artwork and decor along with modern luxuries and amenities. Book your Santa Fe getaway today!